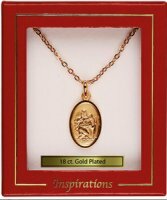 Catholic necklaces, including Virgin Mary, Miraculous Medal, Crucifix and Lourdes apparition necklaces. St. Christopher Necklace - 18 ct Gold Plated. Four Way Medal Necklace with 18 inch Chain. 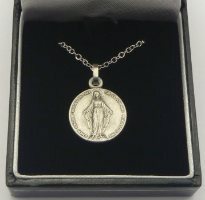 Round Silver Plated Miraculous Medal Necklace. 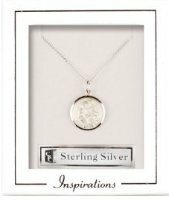 Sterling Silver St. Christopher Necklace. 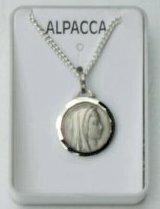 Sterling Silver Cameo Virgin Mary Necklace. 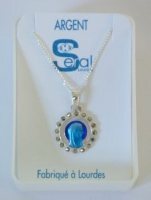 925 Sterling Silver Cameo Virgin Mary Necklace. 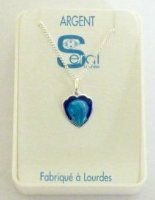 925 Sterling Silver Heart Virgin Mary Necklace. 4 Way Miraculous 925 Sterling Silver Necklace. 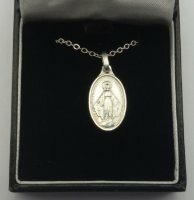 Our Lady of Lourdes Silver Necklace. Gold & Blue Virgin Mary Necklace. 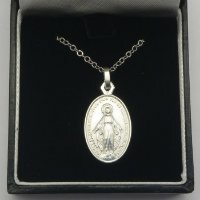 Our Lady of Grace Silver Necklace Pendant 17 mm. 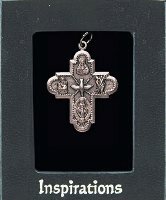 Our Lady of Grace Silver Necklace. 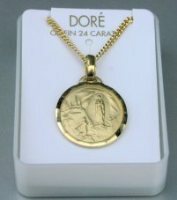 Gold Plated Miraculous Medal Necklace 20 mm.